I’ll let the photos speak for themselves, but as promised, here is your berry cream pie 🙂 This pie is so versatile, and can be made into any type of pie! Add lemon zest and coconut whipped cream for a lemon-iced-box pie. Add canned pumpkin and cinnamon for a pumpkin pie. Easy as 1-2-3! In food processor, pulse dates until fine. Add walnuts, and continue pulsing until mixture is completely combined and sticky. Press crust in the bottom of a spring form pan. Place in the refrigerator while preparing the filling. After cashews are done soaking, first pulse dates in food processor, then adding remaining filling ingredients until smooth. Pour and spread filling on top of hardened crust. Refrigerate. Once pie is hardened, garnish with fresh berries. Store in the fridge for up to 1 week, or freezer for a month. My training partners during college used to tease me because I was religious about replacing my running shoes. Every 4-5 months, no questions asked, even if the tread was still in tact, Katie would be getting new shoes. Ha. I think part of it stemmed from this fear of getting injured from running in old shoes, but if I’m honest, most of it was the allure of a fresh new pair of trainers. the porch outside of our apartment during college….lol not all were mine, but most were mine. Still to this day I love browsing our local running store when I’m bored ha. I’m not quite as fanatic as I used to be, mostly because we’re on a pretty tight budget, but I still rotate my shoes between 3-4 pairs, and try to replace them after I put sufficient mileage on them. Needless to say, I have tried nearly every running shoe on the market, and friends often ask my opinion on which shoes they should get. Which brings me to my next point: which running shoes really are best? Ask any expert, and they will tell you, it totally depends on your training, your foot contact with the ground (ie pronation vs supination vs neutral), and ultimately how the shoe feels. I like to rotate between 3 different types: an everyday heavier trainer, a lightweight trainer, and a super lightweight racing flat. I thought it might help to break it down by what I’m currently wearing. Maybe this will help next time you’re in the market for a new pair! Currently wearing: Saucony Triumph ISO 2 Purpose: every day, well-cushioned trainer. This has been a phenomenal shoe that I’ve worn primarily for walking, easy miles, long runs, and also running up and down the street w/ the baby monitor during nap time ha. Currently wearing: Saucony Triumph ISO 1 Purpose: this is the same shoe as above, but an older model . Love! Currently wearing: Nike Pegasus+29 Purpose: again, every day trainer. This is a super old model, but newer-to-me shoe. I had a gift card to a running store and found these on the sale rack in my size, so snagged them for free! They are a little narrower than I prefer, and a little lighter and more responsive than the Triumph, so I’ll wear them for tempos on occasion, as well as easy miles. Currently wearing: Saucony Kinvara 5 Purpose: tempo, fast workout, lighter shoe with less stability. I wish I could get away with wearing this shoe for every run, because I love it that much. Just not enough cushion for everyday running in my opinion. Probably on my 7th pair of these! They don’t last as long as a more substantial shoe like the Triumph or Pegasus above, but they are so light, yet still supportive for longer runs. I replace these about every 200 miles. Currently wearing: Pearl Izumi N0 Purpose: uber lightweight, ideal racing flat. Straightforward with this one. This is a no frills racing flat with pretty much zero stability or cushion. I wear these in races from 1 mile to about 10k. For half marathons and longer, I’ll jump up to the Saucony Kinvara. I didn’t listen to you guys. . .
You guys told me I was going to be faster, that my fitness would come back, and I’d be even stronger than I was before I got pregnant. I didn’t believe you, nor did I listen. Everyone said there’s this thing called “mom power” and I just shook it off because, yea right I’m going to be sleep deprived and will I ever run again? Serious question. I just didn’t know. Being pregnant was really hard on me. I didn’t handle it well, and I know I’ve said that before, but I want to continue to say it in case someone’s reading this and they are not all roses while pregnant. I didn’t bond with Emerson until she arrived. I don’t know why, I just couldn’t. I couldn’t imagine my life any other way than with Jon and my two pups. Now, I wake up and I can’t wait to see what she is going to do that day. Having her has totally wrecked my world in the best way. With that said, you can imagine my shock when I crossed the finish line of last week’s off-road XC 5k in second place and with a 30 second improvement on my lifetime best. 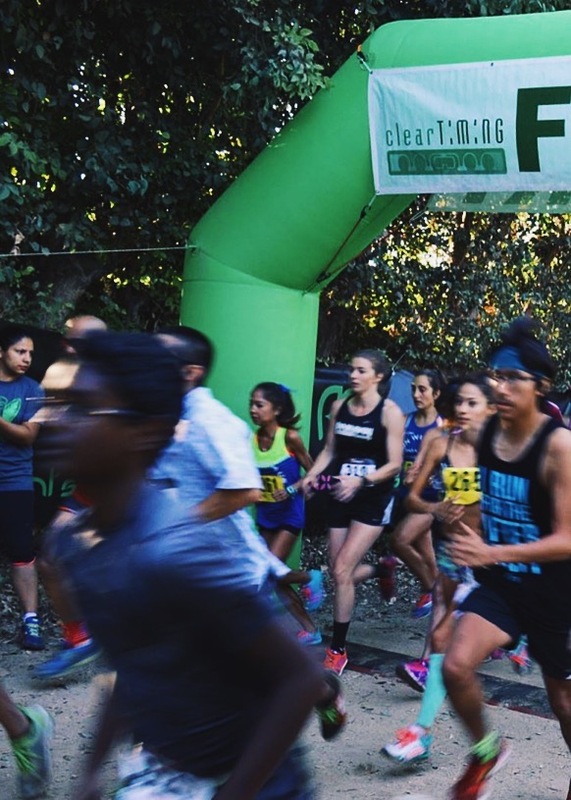 My previous 5k cross country PR was 19:34 and I ran a 19:01 in Los Angeles at Griffith Park. 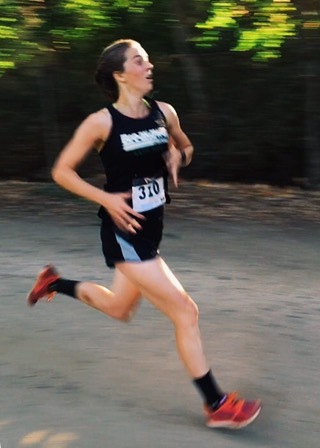 I won’t say I executed the race perfectly, but I gave it my best, and I walked away happy. I still opened up with the first mile in 5:54….ha when will I learn? But when I started to fade at mile 2.5 and a girl passed me, I matched her pace and held her off. I’m proud of my effort, but more importantly, just so amazed at how my fitness has returned, even stronger than before. I hope I make Emerson proud. Being a mom to her is one of my greatest joys in this life. Looking forward to racing a few more 5ks this training cycle. Onward! We found suuuuper cheap tickets with Allegiant Air, and flew out of Memphis on a direct flight to LA. Our goal? See as much as we could of LA, in 3 days, with a 6 month old. Ha, we realized it was a huge endeavor. But we were ready. First, let’s talk this direct flight to LA from Memphis. You guys! Honestly this was not a bad flight at all! People like to bash budget airlines, but all I’m saying is for what we paid for these flights, (like $350 round trip for two! ), we could sit in the lavatory for all I care. But really, not bad, not bad at all. We were nervous about how Emerson would act on the flight. She honestly did SO GREAT. Laughed, smiled, and even slept some. Proud mama. Touched down in LAX, sang some Miley Cyrus, and went straight to get tacos at Mondo Taco near Venice Beach. We had less than 3 days in LA, so pretty much every spare minute was accounted for. The one aspect of the trip we might do differently next time, and definitely would have done differently had we not had a baby with us, was take uber or public transportation rather than renting a car. Our rental car was the most expensive part of the whole trip, but ultimately, it proved to be worth it, as it gave us more freedom, and the ability to leave places whenever we pleased, especially if the baby started to get fussy. With that said, finding parking at Venice Beach on a Thursday night when there’s a concert is terrrrrible. Also, my phone died and Jon and I got separated amidst the masses. Lol you guys. Everyone was totally high and I eventually just asked a group of high school boys if I could use their phone to call my husband. They asked what his name was, to which I said, “Jon, why?” And they all started hysterically laughing. Lol, am I missing something here? They had eaten one too many hash brownies FO SHO… Anyways, we all got reconnected, and took a walk around muscle beach and did a lot of people watching. It was such a nice night, and Emerson was totally content just hanging out in the baby carrier. It was starting to get late and actually really chilly out, so we hiked back to where Jon parked the car, and made our way across town to our airbnb in Highland Park. We chose this area because I had read it was an up-and-coming cool spot in the NorthEast section, with merging cultures and great local eateries. Also, our airbnb was super affordable and couldn’t have been better! Highly recommend this place . We crashed and all three slept so well, which was actually something I was worried about. After debating about sleep arrangements prior to the trip, we decided ultimately not to bring the pack-n-play. Even though Emerson starts off the night sleeping in her crib at home, she always ends up in our bed as I nurse her at night, so we just left the pack-n-play at home, and hoped for the best. It wasn’t ideal, but lugging that thing around seemed awful, and we didn’t want to pay extra to rent one in LA, so we took a chance and all three slept in a queen size bed. It worked. Wasn’t perfect, but wasn’t terrible either. On Friday, we woke up, put on a few extra layers (hello zero humidity! ), and walked about a mile to get coffee at this place. It was such a nice morning, and we took the long way home to take in all the scenery and HILLS. We explored more of NorthEast LA, stopped in some cool little shops, showed Emerson the plethora of cacti and why she should always love succulents forever and ever, and had lunch at Amara, a healthy little delicious kitchen! Because I was racing Saturday morning, we decided to keep the rest of Friday pretty low-key. We took naps in the hammock that was right outside on our private patio, and then had an early pizza dinner before turning in for the night. Ps: also reading this book, as you can see in the photo below. It’s been really great for my mental game! Saturday, I raced a local 5k (more on that later, but I PR’d wahoo! ), and we had such a great morning in Griffith Park! We tried to hike to the Hollywood sign, lolzz it was like 8 miles round trip so we said, “nah, we will hike to the summit.” Then half-way to the summit we changed our minds and turned around and decided to go get brunch instead. ha! Regardless, it was beautiful and awesome to see the city below. We originally were going to go here for brunch, because I had heard some really great things about it, but after seeing the wait was like 2 hours, we made a game time decision to go find sushi instead. Because Los Angeles=coastal city=the sushi has gotta be good, amiright. We were not disappointed ONE BIT when we walked into Sushi by H and looked at the menu. Explosion of deliciousness in our mouths. Hands down the best and most affordable sushi we’ve ever had. If you’re in LA, GO HERE. If you haven’t caught on yet, our trip was pretty much centered around food lol. After our bellies were full of sushi, we went back to the airbnb, took a nap, read in the hammock some more, then got ready for our best food endeavor yet. C’mon, did you think we were going to forget about In-N-Out Burger? Our entire dinner was $7 ha! Because I am a bottomless pit and gluttonous soul, especially while breastfeeding and after I race, I walked to get ice cream after our In-N-Out experience LOL. I am not sorry one bit. Ice cream from this place was NOT A BAD DECISION whatsoever. So so good. Jon opted for beer instead. But howwww? We then packed our bags and got ready for our 4:30 am wake-up call the next morning. Boo. But, wow! What an awesome 3 days. We truly packed so much into the trip, especially with our little munchkin. She did great. Besides screaming the majority of the flight home (cue eye roll….so sorry to the other passengers, yikes), we were really so proud of her and how she just went with the flow the whole trip. I think the flight home was probably just too much. Poor thing. She did finally fall asleep as we taxi’d to the gate lol. And that’s a wrap! Whew, what a whirlwind of a trip, but so so awesome. We vowed when we had Emerson that we wouldn’t stop living, and we would continue to go on trips, and do as much as we feasibly could while raising our daughter. We hope she grows up with an adventurous spirit as a result 🙂 Until next time, LA! I thought breastfeeding would feel like such a sacrifice. Although I had a goal of doing it for 6 months or maybe longer, I secretly thought I’d probably give up earlier, because it would restrict my freedom and other knowingly selfish reasons. Honestly, I was dreading it a little. I was totally unaware of how powerful hormones were, and never thought I’d enjoy the one-on-one time with E as much as I have. My goal is now to do it for a year. Just me and her. It’s amazing. I look forward to coming home to feed her. Its one of my favorite times of the day. breastfeeding wherever. i’m all for normalizing it. it’s a beautiful thing for mom and baby. I thought getting up at 4:30 am to pump then get my running in would be nearly impossible. I’m not saying its easy, but if you want something bad enough, you just do it. I cant really explain it. I just get up, get it done, and move on. There really isn’t time to put it off. Simply put, if I want to run, it’s gotta happen at zero dark 30. I thought I’d still be able to have little side projects and time to do things I “somewhat” enjoyed. I say “somewhat”, because these are commitments I might have had before the baby arrived. I definitely enjoy them, but they aren’t things I’m so so passionate about. For example, submitting articles for a magazine out of Nashville. I’ve been doing this for 5 years, and now it’s all coming to a head and I’ve had to ask myself, “Can I still do this?” Or maybe it’s the handful of people I coach for running. I do it because I enjoy it, not for the money, but do I truly have the time to still do this? This season of life leaves little time for side projects. There just isn’t enough time in the day. I’m going to have to very purposefully choose what I want to do or who I want to see during “that one available hour.” The things I choose to commit to and the people I choose to surround myself with needs to be very thought out. If it’s not thought out, these “fire years” as Sarah Mac describes, will decide for me. These are the fire years. bubble baths? no more time for that. that’s okay. I thought my fitness would take a long time to return. I stopped running at 30 weeks pregnant, but really, I probably stopped at more like 26 weeks, as those last 4 weeks were very minimal running and very uncomfortable. I am totally shocked at how fast it’s all coming back. I ran a 5k last weekend and won! What in the world?! This has been the most fun journey, and it’s not over. I can’t wait to see where it takes me. first postpartum race! Thanks Breakaway Running. I thought my non-parent friends wouldn’t be interested in hanging out because I have a baby. I’m the first of my group of friends to have a baby, which means a lot of things are different about my life compared to my friends who are either single or newly married without kids. I thought my life would seem so boring and I’d have to make new mom friends. I am making new mom friends, but I never thought all my non-mom friends would be totally obsessed with Emerson. It’s hilarious and the best! I love how they’ve taken her under their wing, offered to baby sit so Jon and I can go out, and just loved on our girl. I didn’t expect that. my dear friend Jenna loving on E.
I thought returning to work at 6 weeks postpartum would be so hard. I was completely shocked when my transition back to work went smoothly. I very much expected to have an emotional few weeks or months of missing Emerson, feeling the guilt of being away, etc. I didn’t realize how much I loved my job until I was about 5 weeks into maternity leave and I was “ready to go back to work.” I love Emerson soo much, but I do think going to work makes me a better mom. I look forward to coming home to see her, and I love our time together, but I love my job, too. I always thought I’d be a stay-at-home mom. This definitely took me by surprise. coming home to them every day is the best. Jon’s in school, so this situation works for our family right now. I never thought my marriage would be stretched the way it has been. I am all about being open and honest, because I feel like if I am vulnerable, maybe it will open other people up, too. Vulnerability help us grow as people. Jon and I have an amazing relationship, but if there’s one thing that’s stretched us, it’s this beautiful bundle of joy named Emerson Ruth. She is a pretty easy child, but I keep going back to sleep deprivation, and we are actually sleeping 7-8 hours a night! Not getting the sleep you need (Jon and I both are heavy sleepers and Jon requires 9-10 hours a night, where I function best at the typical 8. We are high maintenance!) and having another human who requires so much attention, will make you say things you don’t mean, and it will make you selfish. It’s all such a learning thing. I can’t imagine where we would be if we didn’t have a strong relationship prior to the baby. It would be bad. With that said, I cannot stress enough, if your relationship is on the rocks or you are having troubles, do NOT think a baby is going to make things better/easier. It will make it harder! We have to be very diligent about putting Emerson down at 7:30pm every night so we can have time together. If we didn’t do that, Jon and I would probably never have a chance to catch up and just be together. We need this time. That’s a small example. We agreed from the beginning that our marriage comes first, and then the child. Everyone does things differently, but for us, we know a happy baby can only happen if there’s a happy marriage, so each day, we say a lot of “I love yous” “I’m sorry” “I’ll do better” and “How can I help”. It’s not always easy, but it’s worth it. It is and will always be worth fighting for. I had (what I believe was) an unusually easy recovery from labor. Within 2 days, I was taking short walks around the neighborhood with E in the baby carrier, and within a week, I extended the walks to about 40 minutes. I felt immensely grateful and honestly, very surprised. You hear the stories about women being in bed for at least a week, unable to walk or really do anything on their own. 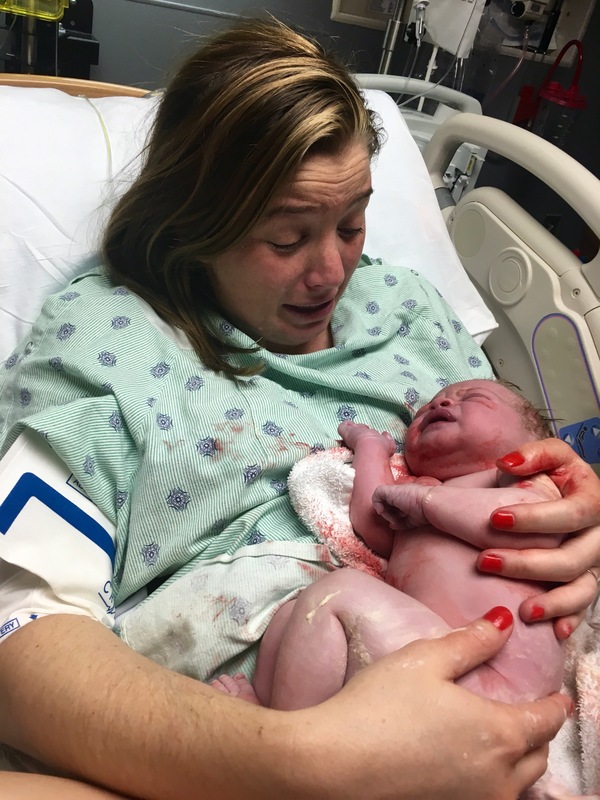 Perhaps it was the rush of adrenaline from the hormones, but I felt pretty amazing, both physically and emotionally very quickly post birth. Those of you who kept up with my pregnancy journey can understand how much of a relief this was. Pregnancy was hard for me. I was allll over the place emotionally, so to FINALLY feel normal and like myself again, even just a few days postpartum, was the biggest breath of fresh air. 2 days postpartum. honestly, feeling great! I promised I’d share my recovery plan week-by-week, so let’s get down to it. Like I said, I was up moving around and going on short walks within a couple days. I remember being wheeled out of the hospital 24 hours after giving birth and thinking, “I really don’t need this wheelchair.” I didn’t say anything to the nurse or patient transporter just because protocol is protocol, but I honestly could have walked to the car by myself. Also, in full disclosure, I did have a second-degree tear, and a few stitches, but I never actually felt anything painful in that regard after birth. Tears really are not as bas as people make them out to be or what you think they might be. Like I said, I never felt it. I would describe the discomfort postpartum more as just, well, discomfort. I gauged my activity levels the first week by the amount of lochia my body produced. One day I went for a 45 minute walk, and I knew it was too much when I was bleeding heavier than normal afterward. Again, not painful, just crampy, and I knew I needed to back off a little bit. During pregnancy, you become pretty self aware of when you’ve overdone it, and postpartum is very similar in that regard. You are the best determiner for your activity level. Your body will let you know, I promise. 7 days postpartum. don’t be deceived, there’s definitely still a tummy. please notice Eli’s jealous face LOL. My goal going into what I called “Week 0” in my training log was simply to start with short walks (20-30 minutes), and to also begin a core and pelvic “re”-strengthening program. I never really understood before I gave birth what people meant by “your core and pelvic area are totally wrecked after you have a baby,” but trust me, I found out veryyyy quickly what they meant. Lol. Basically, you have all this weight in the front of your body that steadily increases over 9 months, and then all of a sudden the majority of it disappears, so you’re left with most likely a tilted pelvis, rotated sacrum, and nonexistent abdominal muscles. Woof. Trying to run with all that jacked up is a terrible idea. Don’t do it. Don’t think you’re “different” and can just power through it. I maintained a pretty intense strength-training regimen up until the day I delivered Emerson, and I was STILL jacked up in the pelvic/core region. So, if there’s anything I can stress in this post, it’s to tackle that area first and foremost. And, be very careful at the same time. 2/6/2016 Sat 25 minute easy walk (1 mile loop) with Emerson in baby carrier. feeling better each day! 2/7/2016 Sun began core/pelvic floor stabilization exercises. kegels–5×5 seconds each lying on back. pelvic tilts on back–3×10 reps holding 10 seconds each rep. sahrmann ab #1–5 reps on each leg. 40 min walk at the park with Emerson in the baby carrier. walked to and from church too. prob overdid it today with the walking. Here are the pelvic/core exercises I focused on. I built my plan based on a variety of recommendations and sources, including Alysia Montano’s postpartum plan, to a physical therapist friend of mine, to even pinterest. I did these daily for the first 3 weeks postpartum, and then moved to every other day, adding in more difficult moves once these got easy. I am currently 8 weeks postpartum and still doing them every other day (you may find you need to keep doing them daily even up to 6 weeks or longer. Figure out what you need.) Whatever you do, DO NOT NEGLECT THIS. Your body and running will thank you immensely! I remember my first postpartum Kegel. I could barely hold it for 5 seconds! Then, it got easier and easier, until one day I did probably 50 reps, and realized I was probably ready to graduate to something more challenging. All in all, the first week was primarily about 1. 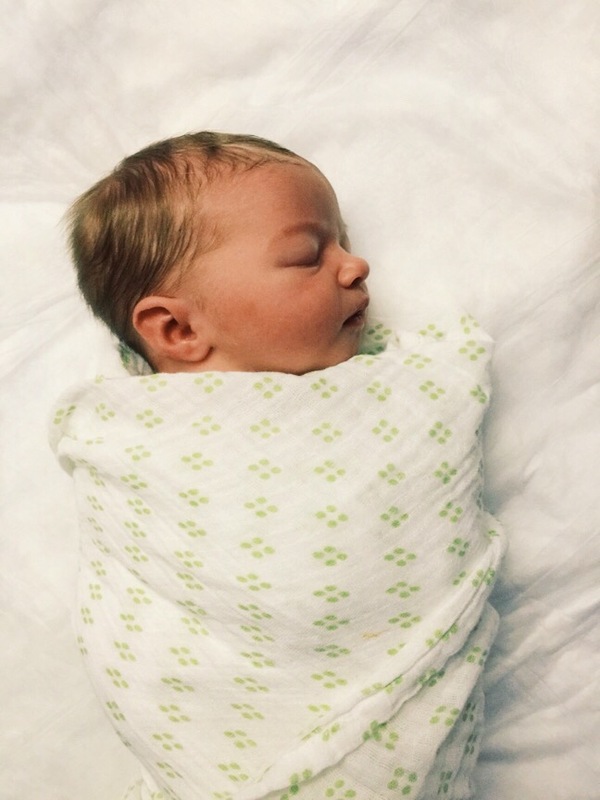 Bringing our baybay home, and understanding how to raise a newborn/taking in all the newness of a sweet little one. And 2. Starting to begin the recovery process for my body. Nothing crazy, just a little commitment each day (probably 1 hour total with walking and strength training). Honestly not bad, and with how much an infant sleeps, you’ll find it easy to fit it in, I think. trying to fit it all in. I finished up this week feeling excited, surprised (at how great I felt), and ready to increase my walking and other activities the next week! Stay tuned! 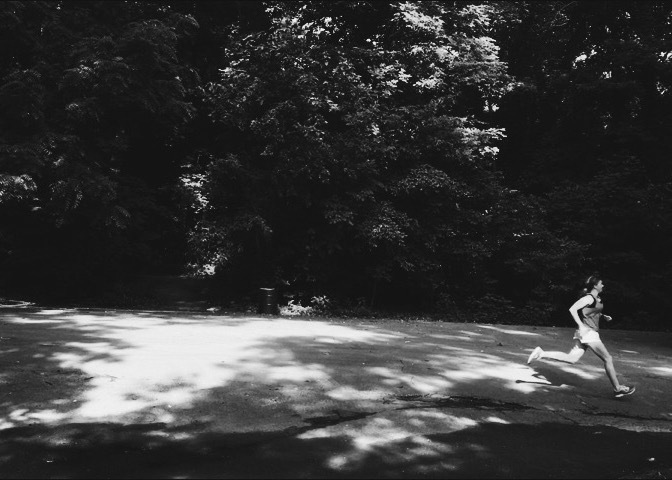 The 6 week postpartum running update. For fear of totally inundating you with a vomit of words on the screen, I’ll give a quick update, then focus on how I’ve managed to return to running and training amidst the millions of hours of breastfeeding, pumping, diaper changing, and on some miraculous days, getting my own life together and taking a shower! WOOF. 6 weeks. It’s the time in a newborn’s life when they “wake up.” All of a sudden this tiny little thing has LUNGS! They discover their hands and feet, and they even start to socially smile. 6 weeks. This is the week I went back to work, and Jon began his manny duties (he coined this term, not me). I will be honest and say it was a pretty rough transition in our house. Jon was incredibly helpful the first 6 weeks of Emerson’s life, but nothing quite prepares you to be a solo parent while the other whisks off to work. At the end of the day, I come home from my job all energized and happy to see them, and he is utterly exhausted. It’s all such a learning process. One thing I do know: he really is the best dad, and I can’t imagine a better person to be there for our daughter at this stage in her life. 6 weeks. By this point, I’ve been running for 4 weeks. I was so surprised when my midwife cleared me to begin exercising (“with caution”) at 2 weeks postpartum. While I was incredibly fortunate to have an easy labor and delivery, I know that I couldn’t have recovered so quickly had I not had a plan in place. At just 2 days postpartum, I was ready to do short walks and begin core and pelvic exercises. Prior to giving birth, I put together a recovery plan, and because it worked so well for me, I want to share! baby’s first visit to the track. Over the next few posts, I’m going to do a week-by-week breakdown of what I did recovery-wise that helped me bounce back so quickly. By the time this post goes live, I’ll be nearly 2 months postpartum, and up to about 30 miles/week with one speed workout + one long run. Overall, I feel good. 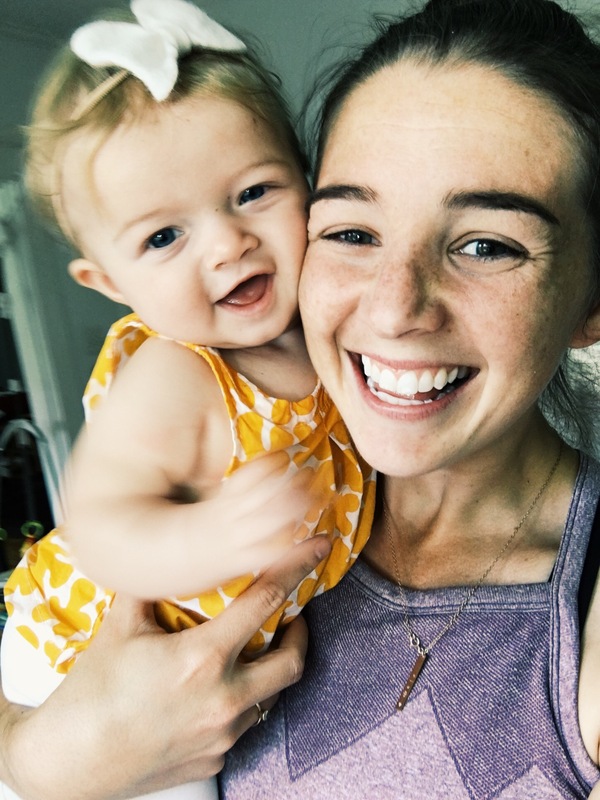 When I was nearing the end of my pregnancy and coming up with this plan, I remember trying to find some sort of similar guide for how to come back safely to running, and what you need to do to ensure you are doing what’s best for you, your body, and your baby. Unfortunately, a lot of women leave the doctor’s office after their postpartum checkup, and are told they can exercise again, but that’s about it. What is safe and reasonable is usually left out of the conversation. Additionally, while there are some very broad resources out there, I couldn’t find anyone’s personal journey, which is what I find to be most valuable. I’m looking forward to sharing what worked for me, and hope you’ll follow along! 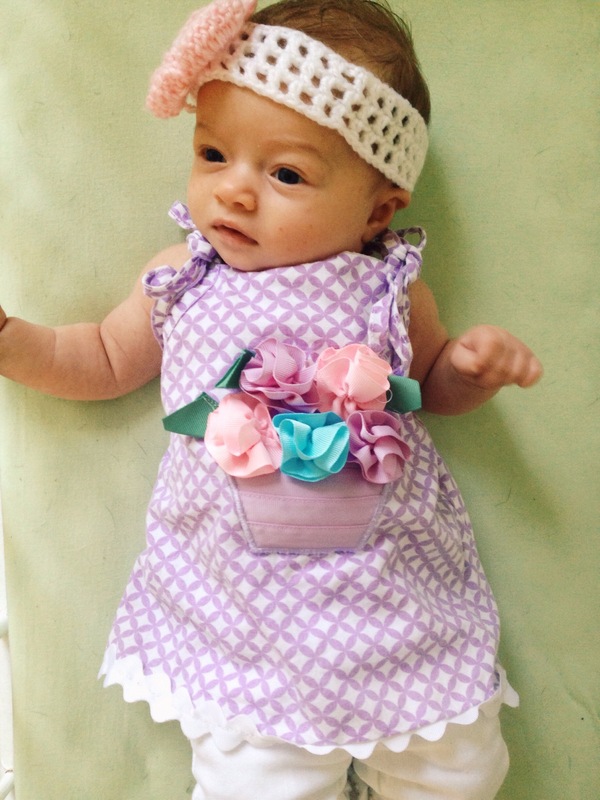 6 weeks with this cute easter egg. She’s here! Part 2 of Emerson’s birth story. 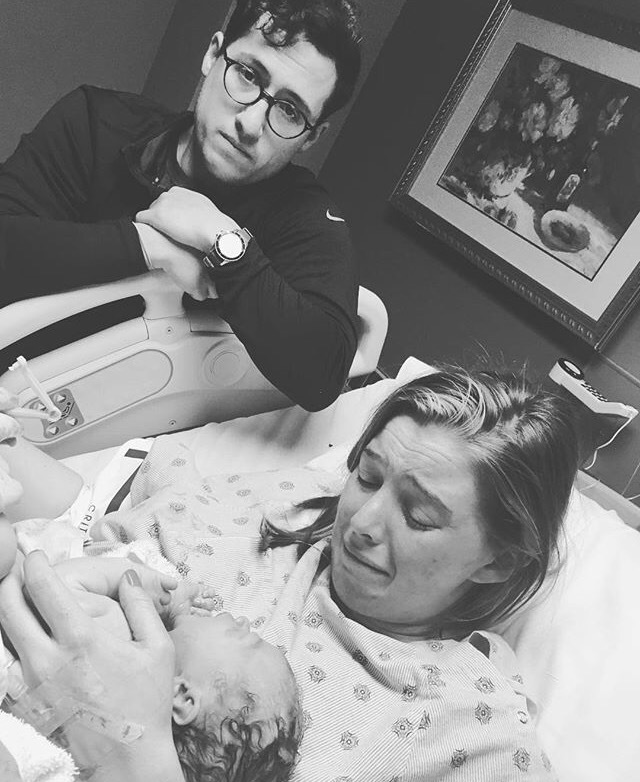 Birth stories are so personal and intimate; I thought maybe I shouldn’t share about the day Emerson arrived. But, I also know both the benefit of writing my thoughts as well as having them documented somewhere. I’d like to say I think our daughter might want to read about the day she came into the world when she’s older. Maybe not? So, let’s get back to the story. If you remember, I was given Cytotec, which is a drug used to induce labor. It’s a tiny pill they insert into your cervix. It doesn’t work for all women, but for some, it can put you into full blown labor, and FAST. The midwife warned me I may go from 0 to 100 within a few minutes. I didn’t know what that meant, but I quickly found out. No joke, within 5 minutes of my water breaking at 10pm, I was having strong contractions just 1 minute a part from each other. I remember one second I was joking around with Beth (my best friend) and Jon (my husband), and then the next, they were still talking and I was doubled over in the bathroom, unable to talk or really do anything. “Ohhhh, so THIS is labor.” Wow. There was no warm up period at all. I moved from the bathroom back to the room, and I put my headphones in while I got on my knees and hovered over an exercise ball. I couldn’t handle hearing outside conversations happening, so I turned up my music super loud so I didn’t have to listen to them talk ha. What was the music of choice? Pandora 90’s hits. Ironically I made this station just a few days before we went into the hospital. Jon and I were driving and we all of a sudden had the urge to listen to some good 90’s music. So, as things were getting more and more intense, Christina Aguilera was telling me she was a genie in a bottle. Or something like that. The contractions continued, and I began to feel out of control. I knew induction drugs could do this, and I didn’t have any prior labor to compare it to, but I felt like I was just hanging on, almost like I was being thrown against a wall by a huge wave. There was no sense of time, but as soon as I’d be trashed from one contraction, another one would come within just a few seconds. The nurse came in at one point and told me the fetal monitors weren’t picking up the baby’s heartbeat because I was leaning over the ball and they kept falling down. We tried to get them to stay on (they are strapped to your belly with velcro) by holding them with my hand, but it still wasn’t picking anything up, and this made the nurse concerned. It made me pissed, because it meant I had to change positions, and I didn’t feel like I could stand up. All I wanted to do was lay on top of the exercise ball. I eventually stood up, because the nurse said I’d have to get into the hospital bed if the monitors kept falling off, so I just basically leaned on Jon and Beth (read: collapsed on them as I tried to stand, still reeling from the pain which was getting even more intense). I tried to remember all the techniques we talked about in Lamaze class like relaxing, breathing, and having someone press on my back, but honestly, in that moment, I was approaching it like I do in a race; I tensed up and just pressed on. I didn’t breathe into it. My shoulders were tense, my legs were tense, I couldn’t relax. I should probably work on that for running, because that really can’t be good. The damn monitors kept falling off. WHY WON’T THESE THINGS STAY ON. The nurse came back in and told me I had to get in the bed so the monitors could pick up the baby. I don’t know why this upset me so much. I knew the baby was fine. I also knew trying to labor while lying on my back in the bed would be so painful. I didn’t want to lay down. But I had no choice. Once in the bed, I started having back labor. Oh dear Lord. I got back on my hands and knees while in the bed. I started crying, leaning over Jon and remember saying softly to him, “I think I’m almost done. I’m trying so hard, but I don’t think I can go much longer. I know we talked about this, and you’re supposed to say to me that I can do it, but I’m telling you I can’t. And I’m okay with that. I’m okay with getting pain medicine.” I believe it had been 5 hours since my water broke. The nurse came back in, the fetal monitors were picking up the baby a little better (still not great because I was still moving around quite a bit while in the bed), but I told her I’d like to get some stadol, a pain med that is essentially a drug that makes you sleepy and “takes the edge off” is what I had read on a few blogs. HA! Yea, it may have been 3 am, but I did not get sleepy, nor did it take the edge off. About an hour later (I think . . .again, no sense of time during all of this. Just pain. ), I said we needed to bring out the big guns. Let’s go for the epi. “I’m okay with doing it.” I said to my husband again. He told me he was proud of me, and that it would all be okay. Because I wasn’t hooked up to an IV (I just had a hep-lock), I had to get some fluids in me before they’d give me the epidural. The fluid bag needed to be empty, which takes about 30 minutes. At that point, even though I could see the light because the epidural was coming soon, I was still in so much pain. Trying to breathe, but watching the fluid bag get less and less was like watching the minute hand on a clock. Brutal. Time was moving so slowly. The epidural finally came, and I told the nurse anesthetist that I loved him, and it must be fun having a job where you get to make people in pain happy again. He was weirded out, but I didn’t mind. He also told me during one of the contractions (because they were still going, and I was still being thrashed about), that I “need to cut that out. There will be no moaning or groaning.” At that point my love for him turned to anger. HAVE YOU EVER HAD A BABY? YEA, JUST STOP TALKING AND STICK THAT NEEDLE IN MY BACK. ha, I didn’t say that, but seriously, who has the nerve to tell someone experiencing the pain of child birth that they need to hush? SMH, MEN. after the epidural. man i feel good. 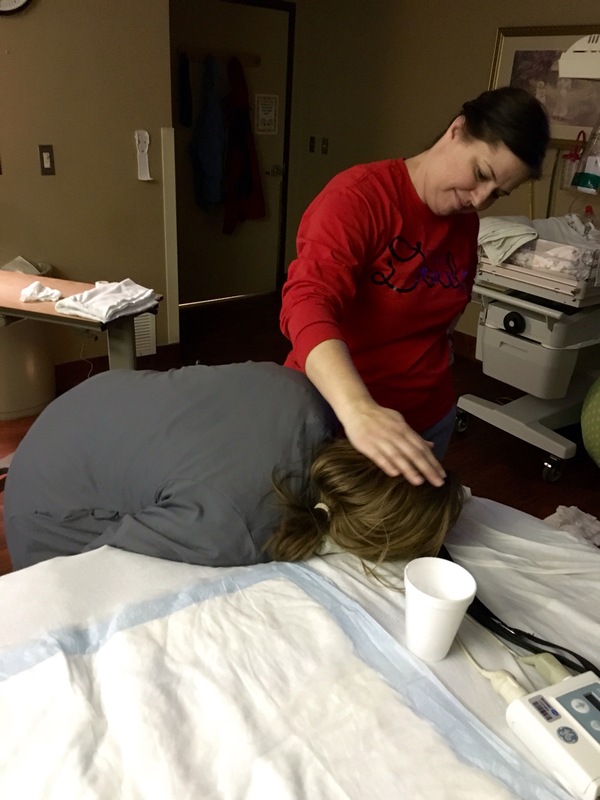 Pretty much as soon as the epidural was given, I felt some relief. It was amazing that with each contraction, the pain became less and less. Amazing. Truly amazing. Do I still want a natural child birth at some point in my life? If we have more kids, yes, I do. But, I’ve never been more thankful for modern medicine. The midwife came back in to check on me an hour after the epidural, and I had dilated to a 10! I couldn’t believe it. I guess that was all I needed. Just needed to relax, and the epidural provided that. I was immensely grateful. Time to meet this baby! The midwife set the room up for the baby to arrive, and it was time to push. 30 minutes later, at 5:20 am, Emerson Ruth Taylor arrived. It truly was the greatest moment. 7 pounds, 4 ounces, 20 inches long. Tons of hair. We are still so overjoyed and can’t believe it. Welcome to the world, E!